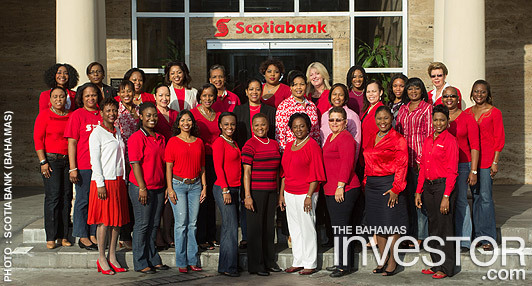 In celebration of women worldwide, Scotiabank will mark International Women’s Day, March 8, 2013 with local and global women’s initiatives in The Bahamas and around the world. “Scotiabank is committed to being a leader in the advancement of women in The Bahamas and we are a proud supporter of many local organizations focused on helping women on a personal and professional level,” said Kevin Teslyk, managing director. 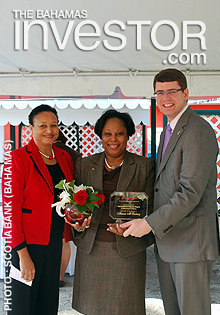 The bank recently celebrated the one-year anniversary of its Advancement of Women (AoW) group. The group’s mission is to enhance the professional development of women and allow for greater success through on-going support, guidance, introduction and exposure to professional organizations, referrals for business and personal growth and opportunities in the market. Chairperson of the bank’s AoW group, Alanna McCartney announced the bank’s new recognition programme. The three successful Scotiabank businesswomen recognized this year are: Glennette Reckley, senior manager, compliance and legal services; Na-amah Rahming, Scotia Private Client Group; Lillian McPhee, administrative support officer. The bank is making donations in honor of the Her Success, Her Way candidates to The Bilney Lane Children’s Home, The Women’s Crisis Centre and The Nazareth Centre for Children. Globally, Scotiabank will mark International Women’s Day with a donation to Plan Canada’s ‘Because I Am a Girl’ initiative, a social movement to claim a brighter future for girls in the developing world. Scotiabank will also sponsor the International Women’s Day website. Reining in government debt through redressing recurrent expenditure and revenue imbalances, as well as committing to reducing the fiscal deficit with various structural fiscal reforms, will comprise of a medium-term consolidation plan, according to State Minister for Finance Michael Halkitis.